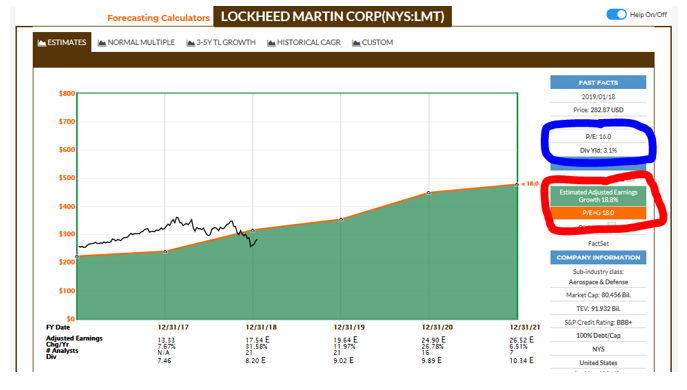 Lockheed Martin (LMT) is the world’s largest defense contractor. Headquartered in Bethesda, Maryland, LMT is a global security and aerospace company that employs approximately 100,000 people worldwide. 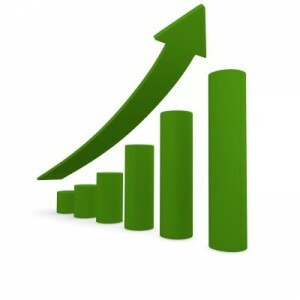 LMT is a Dividend Contender and Dividend Achiever with 16 straight years of dividend increases. Recent price declines have brought its price into attractive territory after years of seeming to be perpetually overvalued. To analyze LMT, I will use the approach described in DGI Lesson 14: Grading Dividend Growth Stocks to Find the Best Ones for Your Portfolio. 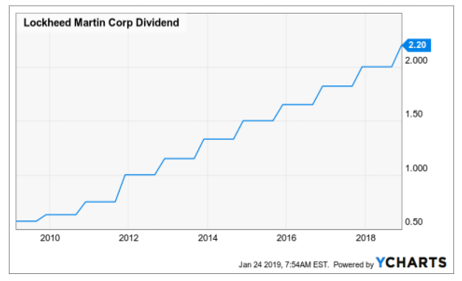 This is a very good dividend picture. At its current price, LMT is a mid-yield, fast-growth stock. 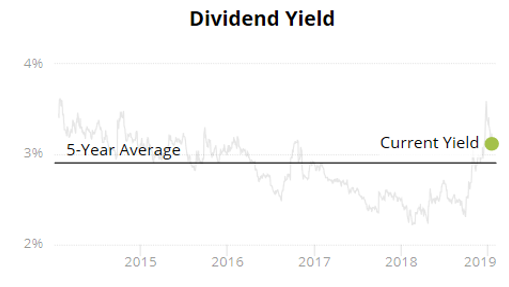 Its 3.1% yield puts it near the average for all Dividend Contenders, and above the average for all stocks on the Dividend Champions document (CCC). 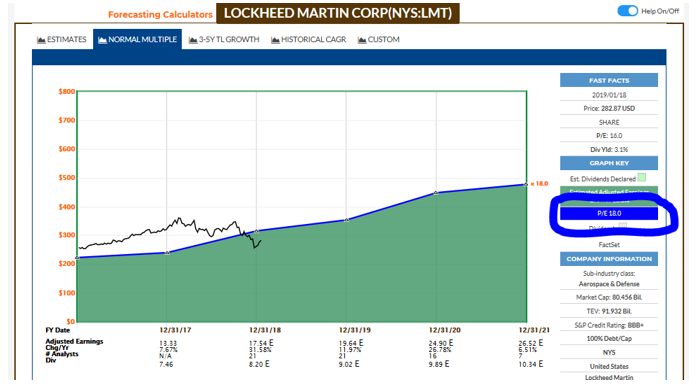 Given its 3.1% yield, LMT’s 5-year dividend growth rate (12.4% per year) would be considered very fast. Last year’s increase, at 10%, was a little below its 5-year average. In its 2017 annual report, LMT highlighted its commitment to return cash to shareholders in the form of dividends and share repurchases. I would expect to see a similar commitment in its 2018 annual report, which is coming up in about a week. 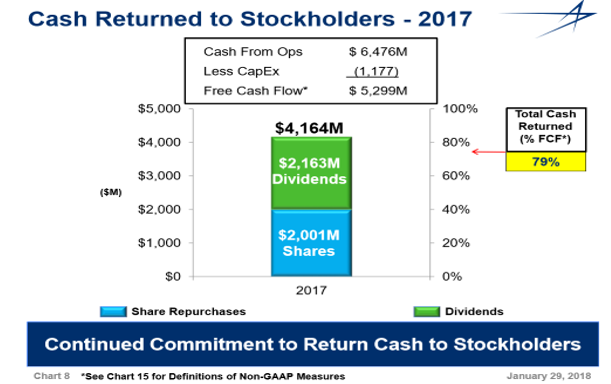 Dividends and share buybacks consumed 79% of LMT’s free cash flow in 2017. LMT is principally engaged in the research, design, development, manufacture, integration, and sustainment of advanced technology systems, products and services. That’s their own brief description of themselves. Oddly, they don’t mention that their products are generally designed for military purposes. With sales of around $53 billion, LMT is the world’s largest military weapons producer. LMT derives about 60% of its sales from the U.S. Department of Defense, 20% from other U.S. agencies, and 20% from international militaries. About 1% of sales are made to commercial (non-military) customers. The company operates four business segments. The Aeronautics segment primarily makes fighter aircraft. The F-35 fighter jet program is a growth driver for LMT, despite headlines about its cost and performance. 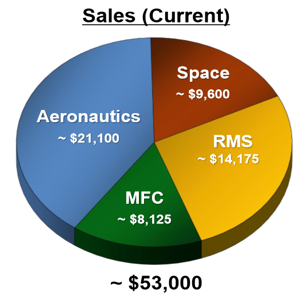 Rotary and Mission Systems is the 2nd-largest segment. It produces combat ships, ship and submarine combat systems, systems and sensors for rotary and fixed-wing aircraft, and naval electronics. 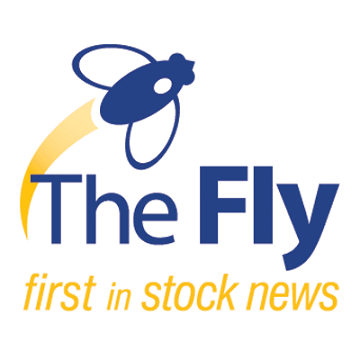 It also houses the 2015 acquisition of Sikorsky (helicopters). Space Systems produces satellites, strategic and defensive missile systems, and space transportation systems. About 85% of its sales go to U.S. government customers. The MFC segment produces air and missile defense systems; tactical missiles; and related weapons and military systems. This slide from LMT’s 3rd-quarter earnings presentation shows the relative size of the 4 business segments. The main thing to notice about LMT’s business model is its dependence on government military and space spending. The U.S. defense budget, which accounts for about 40% of global military weapons spending, is the source of about 60% of LMT’s revenue. Most experts believe that U.S. military spending is and will remain on an upward trajectory for years to come. The U.S. fiscal 2018 defense budget has plenty of room for higher defense outlays. However, there is opposite speculation that due to political gridlock, defense budget caps may return in 2020. Obviously, all of this is speculation; there is no way to know the future. LMT gets good ratings across the board, except for the S&P credit rating. We’ll talk about LMT’s debt situation in the next section. I usually begin this section by seeing how Value Line rates a company’s financial strength. Then I go through specific financial metrics and see if I agree with Value line’s overall assessment. Let’s look at some key financial categories and see if we agree. Return on Equity (ROE) is a standard measure of financial efficiency. ROE is the ratio of profits to shareholders’ equity. The average ROE for all CCC stocks is 17%, and for S&P 500 companies it is about 13%. The following chart shows LMT’s ROE 2008-2017. LMT’s trailing 12-month ROE is 203%. Those numbers look like misprints, but they are not. One characterisitic about ROE is that it can be goosed (and distorted) by high levels of debt. We’ll look at LMT’s debt next. 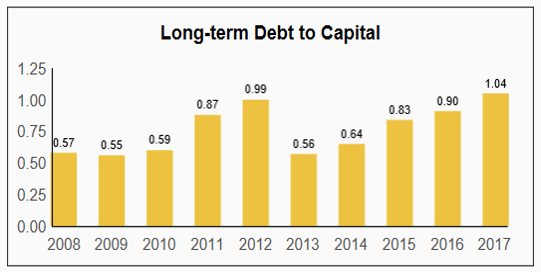 Debt-to-Capital (D/C) ratio measures how much the company depends on borrowed money. Companies finance their operations through a mixture of debt and equity (shares issued to the open market) as well as their own cash flows. High leverage creates risk. The higher the D/C ratio, the riskier the company is. Debt must be paid back, so debt repayments create a constant draw on the company’s cash flows. A typical D/C ratio for large companies is 50%. LMT’s debt ratio is double that. LMT’s D/C ratio is above 1.0. In other words, its capital structure has more debt than capital. This is an unusual situation, and in my opinion it is a risky way to finance a company. Not only that, LMT’s high-wire act with debt has been increasing annually for the past several years. Since 2013, it has increased its D/C ratio from a normal-range 0.6 to its current state of >1.0. As we saw earlier, S&P’s forecast in 2015 of continued high returns of cash to shareholders (i.e., dividends and share buybacks) turned out to be correct. They didn’t use their cashflow to pay back debt, indeed they have increased the debt ratio since the Sikorsky acquisition. While I consider LMT’s debt to be a caution flag, I don’t think it is a knock-out concern for the stock. I base that conclusion on the facts that its credit rating is “investment grade,” Simply Safe Dividends rates its dividend as safe, and the company creates strong cash flows. Operating margin is one of my favorite financial metrics. It measures profitability: What percentage of revenue is turned into profit after subtracting cost of goods sold and operating expenses. Per recent research, typical operating margins for S&P 500 companies have been in the 11-12% range. 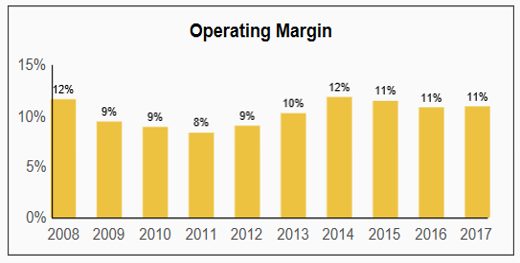 As you can see, LMT’s operating margin has been quite steady for several years, and it’s right in the average range for large corporations. Not outstanding, but not a problem either. Earnings per Share (EPS) is the company’s officially reported profits per share. We want to see if a company has had years when it officially lost money, or if its earnings are steadily increasing, declining, or flat. 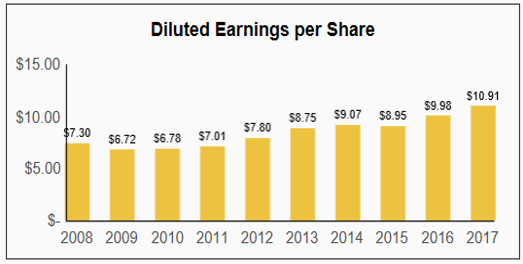 LMT has delivered positive earnings every year for the past 10, and they have a noticeable uptrend. Earnings have increased in 7 of the 9 years through 2017, and the company guided to about a 5-10% increase for full-year 2018. Free Cash Flow (FCF) is the money left over after a company pays its operating expenses and capital expenditures. Whereas EPS is subject to GAAP accounting rules, cash flow is a more direct measure of money flowing through the company. It’s the money a company has available for dividends, stock buybacks, and debt repayment. Excess FCF allows a company to pursue investment opportunities, make acquisitions, repurchase shares, and pay/increase dividends. LMT’s cash flow is very strong. Not only does LMT generate lots of cash, its record shows a generally rising pattern, albeit with significant occasional breaks. FCF has risen in 6 of the past 9 years through 2017. Share Count Trend shows whether the company’s outstanding shares are increasing, decreasing, or remaining flat. I like declining share counts, because the annual dividend pool is spread across fewer shares each year. That makes it easier for a company to maintain and increase its dividend. By buying back its own shares, the company is essentially investing in itself and expanding each remaining share into a larger piece of the pie. For many years, LMT’s shares were overvalued, in my opinion. It’s better when a company targets its buybacks to times when its stock is undervalued. A lot of the money used for the buybacks has come from debt. I would have preferred to see the company pay down its debt rather than increase it for the past several years while buying back shares. The red line depicts Morningstar’s estimate of fair value, while the black hash marks indicate LMT’s actual price. You can see that LMT’s price has been above fair value since early n 2013. Nevertheless, LMT was buying back shares steadily the whole time. I think that Value Line’s financial grade of A++ for LMT is too high. I see their finances as good in spots but not good in other spots. I don’t like LMT’s use of so much leverage to finance operations, dividends, and share buybacks. Balance sheet leverage, business risk, the level and direction of profits, cash flow, earned returns, cash, corporate size, and stock price, all contribute to a company’s relative position on the scale. 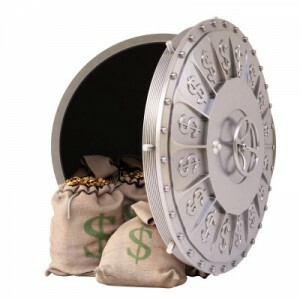 The amount of cash on hand, net of debt, is also an important consideration. My 4-step process for valuing companies is described in Dividend Growth Investing Lesson 11: Valuation. Step 1: FASTGraphs Basic. The first step is to compare the stock’s current price to FASTGraphs’ basic estimate of its fair value. The basic valuation estimate usually uses a price-to-earnings (P/E) ratio of 15, which is the historical long-term P/E of the stock market, to create a baseline “fair value” reference line. However, for high-growth stocks, FASTGraphs raises the fair-value reference P/E ratio to equal the stock’s estimated earnings growth rate. This approach recognizes that fast-growth stocks normally carry higher P/E ratios, as investors are often willing to “pay up” for the growth. I circled in red LMT’s estimated earnings growth rate, which is 18.8% from FASTGraph’s sources. Because this is >15, FASTGraphs set the orange fair-value reference line at a P/E of 18 rather than 15. Since the black line (LMT’s price) is beneath the reference line, that suggests that LMT is undervalued. To calculate the degree of undervaluation, we make a ratio out of the P/Es. I circled in blue LMT’s actual P/E of 16.0. So for the valuation ratio, we have 16 / 18 = 0.89. In other words, LMT is undervalued by 11% as estimated by this first method. We calculate LMT’s fair price by dividing the actual price by the valuation ratio. We get $283 / 0.89 = $318 for a fair price. Note that I round dollar amounts to the nearest dollar. That’s to avoid creating a false sense of precision in making valuation assessments. 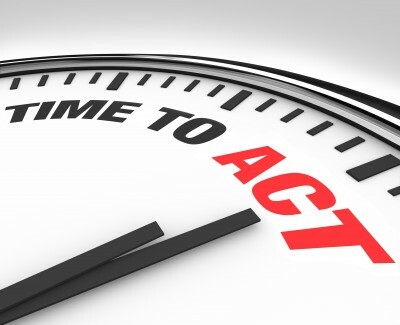 Since valuation involves future events, it cannot be precisely known. Step 2: FASTGraphs Normalized. The second valuation step is to compare LMT’s current P/E to its own long-term average P/E. LMT’s 5-year average P/E of 18.0 (circled) is higher than its current P/E of 16.0, so the black price line again falls below the reference line. As in the first step, the stock appears to be undervalued. Using the same calculation methods as above, we get the following results for LMT’s valuation. Just by coincidence, the numbers are the same as in the first step. Step 3: Morningstar Star Rating. Morningstar takes a completely different approach to valuation. They ignore P/E ratios and instead use a discounted cash flow (DCF) model for valuation. Many investors consider DCF to be the best method of assessing stock valuations. My experience with Morningstar is that they have an admirably comprehensive and detailed approach. They make logical, conservative projections of all the company’s future profits. The sum of all those profits is discounted back to the present to reflect the time value of money. The resulting net present value of all future earnings is considered to be the fair price for the stock today. 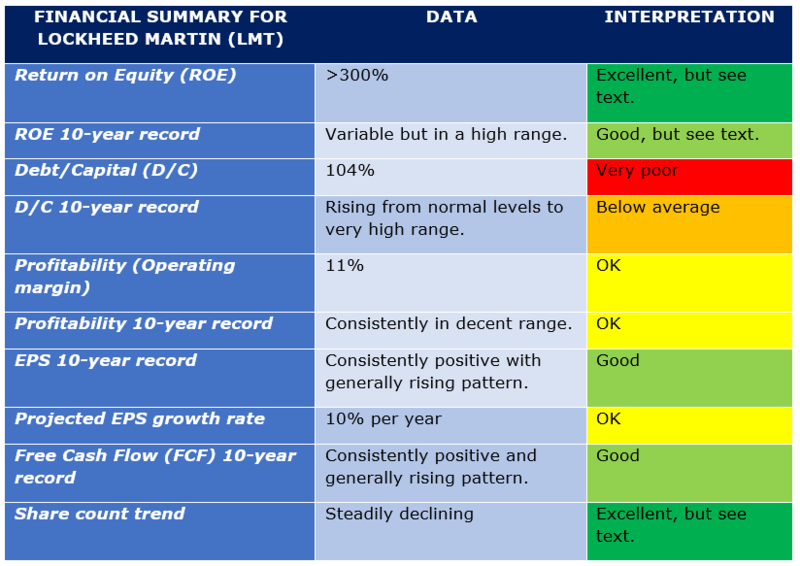 Morningstar gives LMT 4 stars on their 5-star scale, meaning that they consider the stock to be undervalued. Morningstar calculates that LMT’s fair price is $329, meaning that it’s selling at a 14% discount. Step 4: Current Yield vs. Historical Yield. My last step is to compare the stock’s current yield to its historical yield. This way of estimating fair value is based on the idea that if a stock’s yield is higher than usual, it may indicate that its price is undervalued (and vice-versa). This chart shows LMT’s current yield (green dot) compared to its 5-year average (horizontal line). LMT’s 5-year average yield is 2.9%, while its current yield is 3.1%. When the current yield is higher than the historical average, that suggests undervaluation. LMT’s current yield is 7% above its 5-year average. Flipping it around to get a valuation ratio, we get 2.9% / 3.1% = 0.94, or 6% undervalued. I consider anything within +/- 10% of fair valuation to be fairly valued. Using the valuation ratio of 0.94, LMT’s fair price computes to $283 / 0.94 = $301. 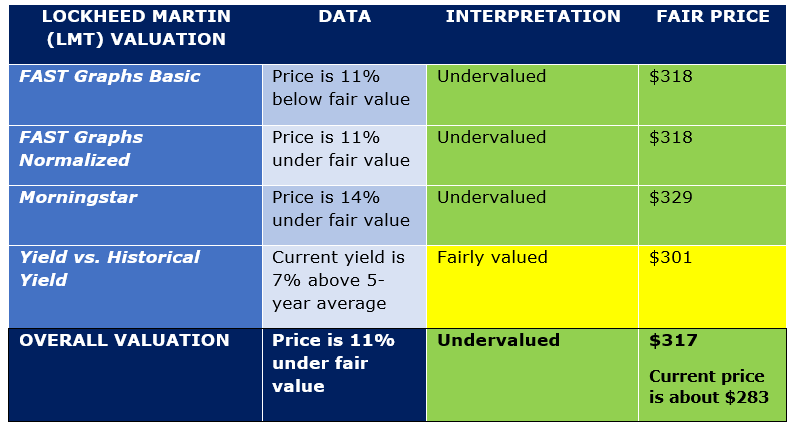 All 4 valuation methods are in agreement that LMT is undervalued. Together they suggest a fair price of $317. For comparison, CFRA has a 12-month price target of $420. That’s quite high, in my opinion, but it supports the suggestion that LMT is undervalued. They present fewer occasions to react emotionally to rapid price changes like sudden price drops that can induce a sense of fear. There is industry research that suggests that low-volatility stocks outperform the market over long time periods. LMT’s beta is comparable to the market’s, with a 5-year beta of 0.94 compared to the S&P 500’s 1.0. That means that its price has been about as volatile as the index. This is a neutral factor. In their most recent report on LMT, CFRA shows the recommendations of 21 analysts who cover the company. Their average recommendation is 3.8 on a scale of 5, where 5 means “buy” and 3 means “hold.” The rating translates to “buy/hold.” This is a slight positive indicator. What’s the Bottom Line on LMT? Good dividend record: Mid-yield (3.1%) combined with a consistently fast rate of growth (10%+). Good Dividend Safety grade of 78/100 from Simply Safe Dividends, suggesting that the dividend is safe and unlikely to be cut. Management has stated that it is committed to “returning cash to shareholders” through dividends and share buybacks. Solid business model: LMT is the largest defense contractor in the world, and defense and military spending shows few signs of slowing down. Highest moat rating from Morningstar and highest Safety rating from Value Line. Acceptable financials, highlighted by steadily positive earnings and cash flows. Stock is around 11% undervalued. It is dependent on continuing government spending on defense and weaponry. It has too much debt, combined with a BBB+ credit rating (low investment grade). Overall, I see LMT as an attractive dividend-growth investment opportunity at its current valuation. It is unusual to be able to purchase this company at its present valuation, because the stock has been overvalued for years. 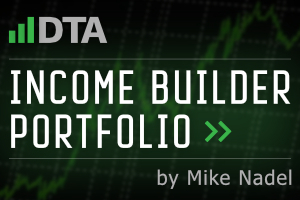 For another analysis of LMT, my colleague Mike Nadel made LMT one of the first additions to DTA’s Income Builder Portfolio last May. He explains his selection in this article. 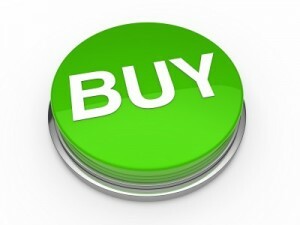 Finally, remember that this is not a recommendation to buy, hold, or sell LMT. Always do your own due diligence. Think not only about the company’s quality, dividend outlook, and business prospects, but also about how and whether it fits your personal financial goals.